Previous PostThe 200 Dollar Rescue Glock Project is now completed.Next PostTactical Semi-Auto Shotguns. I am a Man… a Manly Man… I sweat Testosterone and crap Excellence. My first “motorcycle” was a 1955 Sears Allstate Motor Scooter. It was slow, not great in the breaking department, and handled like a pregnant cow. However, it taught me how to ride. It would run 45 or so, and got me where I wanted to go. I learned all of the motorcycle fundamentals… for a low price and in a fairly safe manner. I graduated from that to a real motorcycle, a 1978 Honda CM400T Hawk. This one did it all, it could run down the interstate and up the backroads. 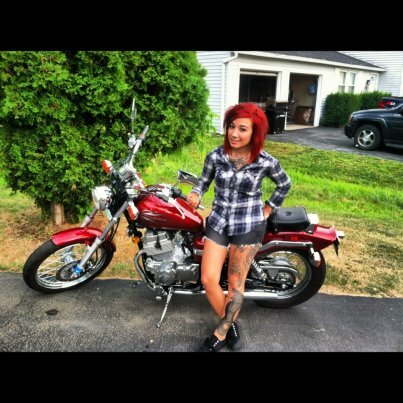 I still have a very fond place in my heart for this bike. Next was a 1989 Suzuki Katana 750, which later got an 1127cc heart transplant. “Back in the day” most people climbed the displacement ladder. Current 600cc bikes are faster than the old liter bikes, but people still seem to see them as good learning bikes… because they are light and have smaller engines. Would I have loved one of the fire breathing liter bikes when I was a pup? OH HELL YEA! But, I would have had a lot less of a chance to be alive and annoying people today. I know that, at least in some places, in Europe they have a tiered license system. You are restricted on power to weight ratios based on your experience. Not saying that we need that here, but some self policing… or better judgement isnt a bad idea. 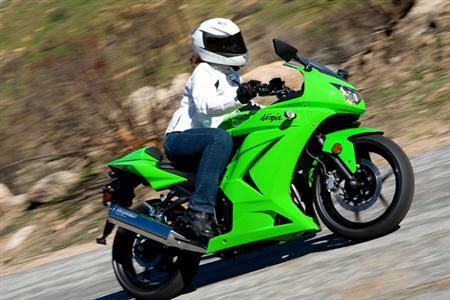 Having said all that… how do you feel about the Ninja 500cc as a starter bike? If You’ve ridden before… maybe. If you are a real starter… probably not. I rode a Yamaha Jog 50cc scooter in Nagoya Japan… which means I’m so hard I chew Harley Davidson’s like bubble gum… but nothing with a manual transmission. Sound like the 250 is the way to go. Depends on your attitude. The ninja 500 has been a great starter for about 20-25 years now. If it “fits” you go for it! That’s the trick with the Ninjas: there’s twins and there’s I-4’s. I’d only recommend the twins. I highly recommend a good rider safety course. Here in Texas, it takes the place of the riding portion of the license test. All you do is the written portion at the DPS office. The course I took was sponsored by Honda and used the venerable Nighthawk 250. I then made the perhaps questionable decision to buy a Buell M2 Cyclone as my first real bike. Loved it. No crotch rocket, but quicker than me and plenty fast. Next bike will be more cruiser less sport. While I think that 250CCs are a great size of bike, I must interject one thing here. It all depends on what your use will be, physical size you are and how aggressive that are naturally. I certainly do not condone all out sport bikes (600cc and larger) as first bikes, I do condone larger bikes for some. If you are a larger person, get a bigger bike. If you plan to do a lot of highway riding, 250 ninja may be fine, but not the cruizers. I would recoment a 650cc bike. They (cruisers, standards and sporty bikes) have decent get up and go, better brakes (than the cruiser 250s) and the aggresive types won’t grow out of them in a season. My first bike is/was a 750 standard. It was the perfect choice for me, and I only had 2 miles experience on a moto. I just really “grew out of it” last season, which was five years after I bought it. The bike now has 40K miles with plenty of drops (parking lots) but (knock on wood) no crashes. The best advise (not that anyone asked) is for a person that wants to get into riding or THINKS that they may in the future is to take the MSF course. Borrow the gear or buy really cheap stuff to get through the course. They tend to ride 125cc, 200cc and 250cc bikes and you should be able to tell if they are right for you. The side bonus of the course is that in most states you can just go pick up your M endorsement and then show insurance more years of experience if you delay in making the big purchase. 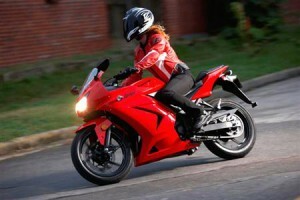 One thing to consider about the 250cc bikes is that they are cheaper to insure. A used 250cc with the state minimum liability insurance can make nice budget transportation. In some states when you get to 600cc or over your rates start climbing. Also with some insurance companies the MSF training course certificate can get you a discount on your motorcycle insurance. The Ninja 250 has a pretty good selection of aftermarket parts available, handle bar risers, taller windscreen, seat options, and other stuff. It also has a somewhat larger gas tank than other 250cc bikes so you aren’t constantly looking for gas stations if you ride to work on it. The Honda Rebel is good around town because of the low seating position make stop and go a bit less tiring. They are used by a lot of training schools. Another nice thing about them is you don’t have to pull fairings off to work on them. Looking to get back out after 30 years . Last bike was a 72 CL 350 Honda which was to small for my height. 6’3″ Have a 77 GS 750 in waiting but might consider a more current bike. The lowrider types don’t seem to fit well , so any recomendations? Dual sports will all have taller seat heights to fit a taller rider. My WR250X is rated at 71MPG and is every bit as much fun! 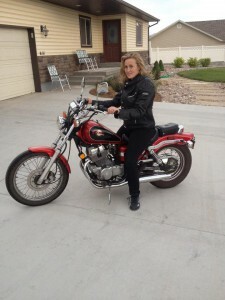 My wife rides a Rebel 250. with her mild riding habits she was getting 95+ mpg. She was not happy, she wanted a hundred mpg. We changed the wheel bearing grease for sythetic changed the engine/trans lube to sythetic and opend up the air box a little and TADA! 105mpg. She loves her little Rebel. She has never had any problem other than being very cold natured. I concur with your suggestions and will add one- A 250 dual-sport, will have much lighter weight, lower seat and center of gravity than say a KLR650. – the thing about a dirt capable machine, is that it let’s a person make a host of mistakes, fall down, learn to control front wheel washouts, rear wheel slides under power and brake, all at low speed and consequence away from cars. . And have a ton of fun. dirt riding is one of the very best ways to learn motorcycle control. Problem is ego- a lot of folks think it is somehow demeaning to ride a little bike. But better to ride a small bike well, than a tank poorly.